For the signatures, I'm using heavyweight paper that I painted on one side (nicer if painted on both! 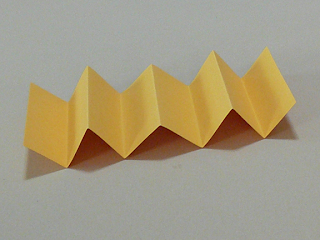 ), and a piece of yellow Canson Mi-Tientes for the accordion. 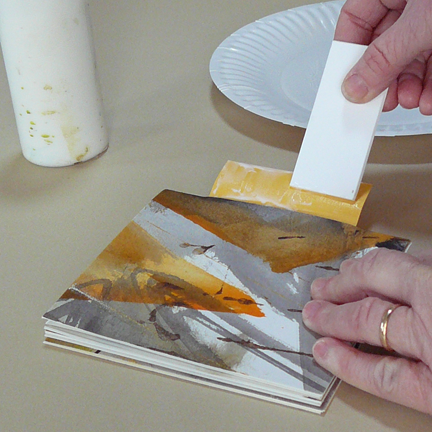 See Painted Paper: Techniques & Projects for Handmade Books & Cards for painting techniques with acrylic inks. Start by folding the accordion into eight panels. 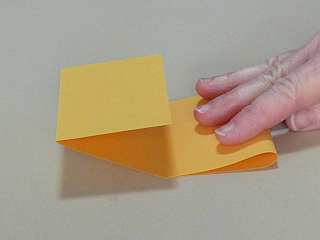 Fold long strip in half, widthwise. 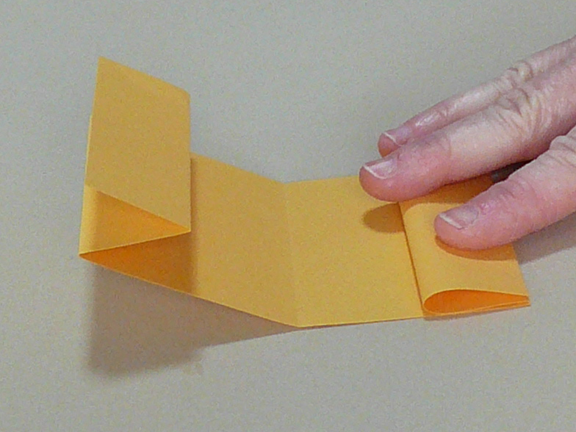 Fold ends in to center fold. 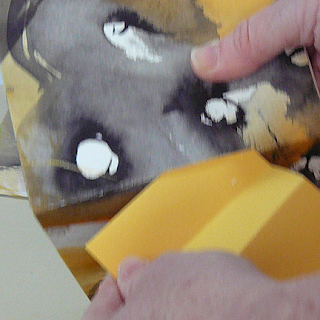 Fold ends back out to new folds. 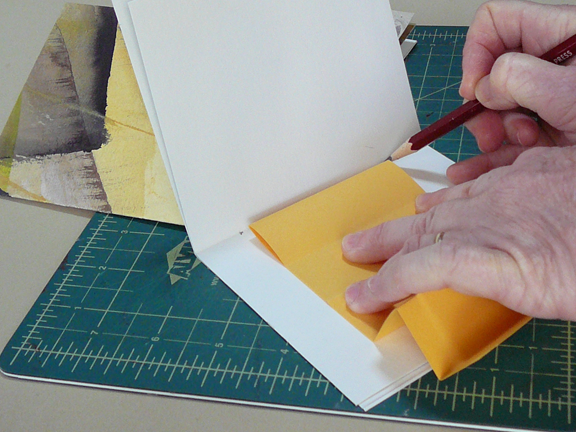 Bring folded edges to center and press down. Open to accordion, ends pointing up like a W.
you can nest them into signatures. you may wish to trim them evenly. 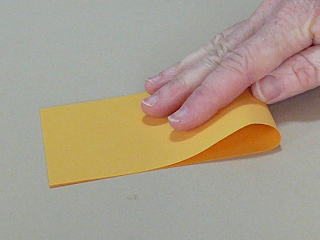 mark on the fold of the signature at each end. Tip: Use the first signature for a template. then cut the slits by connecting the holes. mountain fold into one of the slits. 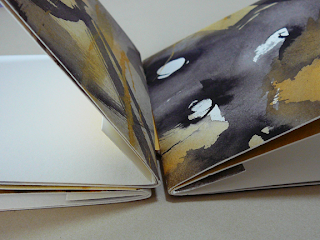 Continue with the remaining mountain folds and signatures. inside the mountain folds that show inside. Slide one strip into the tube made by the mountain fold. 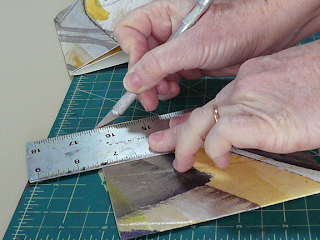 Continue with all strips and mountain folds. 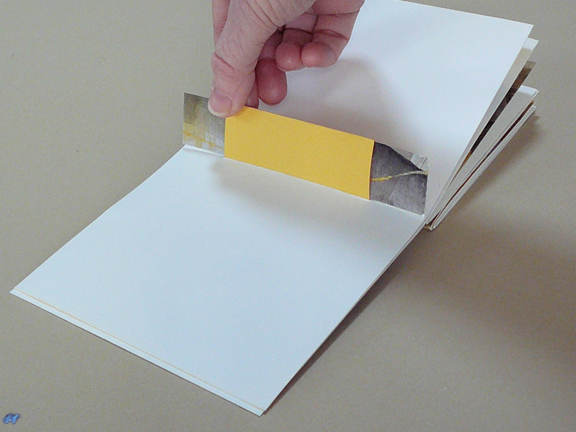 that shows on the outside of the book. Press down and wipe away any glue immediately. Repeat the previous steps for the other end. 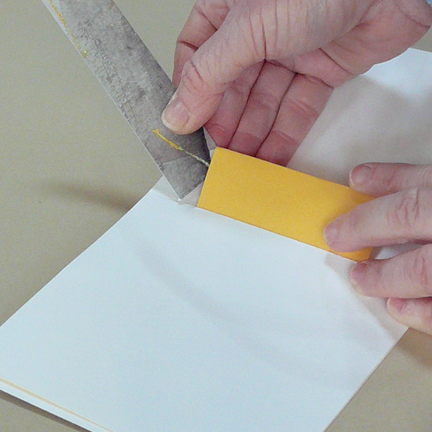 Press down with a bone folder to firm up the folds. This model has three signatures. as shown, above, and use six signatures. Use six signatures with 6-18 pages, total. 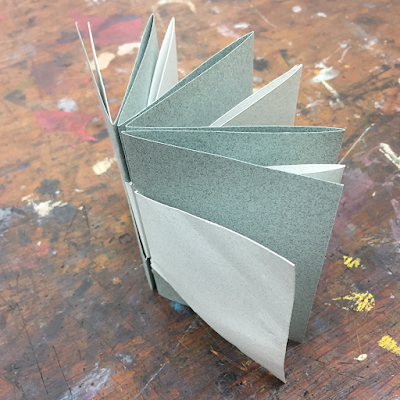 Attach a different style cover, such as open spine (p. 206, Making Handmade Books: 100+ Bindings, Structures & Forms or other covers, pages 203-220). 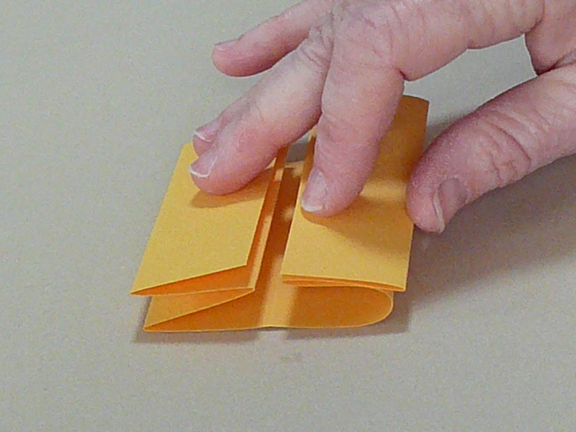 Sew the outer accordion flaps instead of gluing them down. 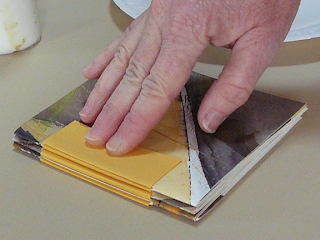 Cut slits in the front and back cover and weave the ends of the accordion into the covers. Make a flag book by using cards and putting the slits 1/4" [64 mm] from the left edges of the cards instead of through the center of signatures. 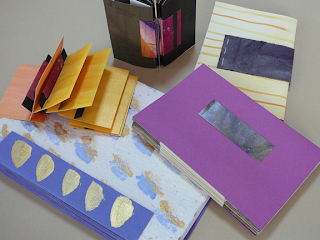 Make several books and create a handmade box for them! Alisa, thanks so much for sharing this info--great visuals! 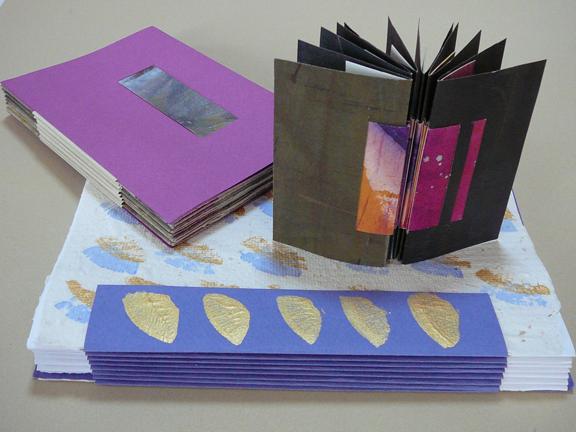 Handmade books are great for gifting, it seems to me. Best to you as 2012 nears its close! Given the local propensity for abbreviating everything, I expect it will be known as Aussie(or Oz) Hinge! You're welcome to all, and thanks for comments. 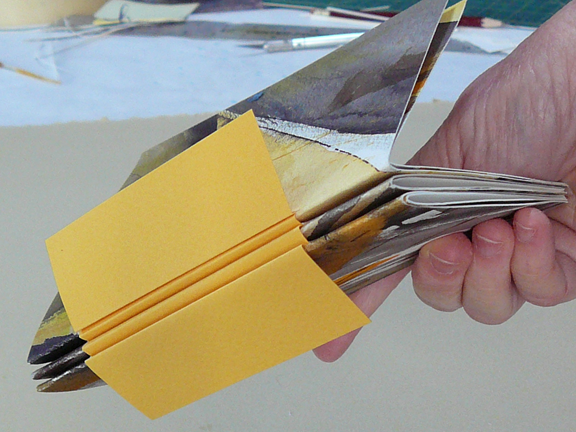 I think there are a million possibilities for this, including cutting windows in the mountain folds that would reveal pictures or words on the cards. 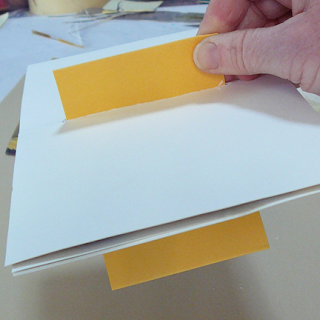 And I wonder how it would work with cloth, with perhaps a stiffener fused to strips for the "cards?" Whatever you find for the Oz book, we look forward to hearing about it! just discovered your blog and super impressed. must try this OZ bind. 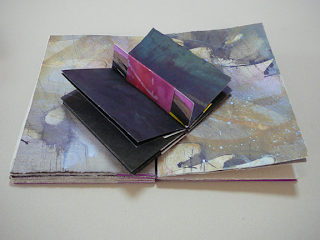 I was thrilled that you liked my gift so much that it made it onto your blog! You mentioned cutting windows into the mountain folds. 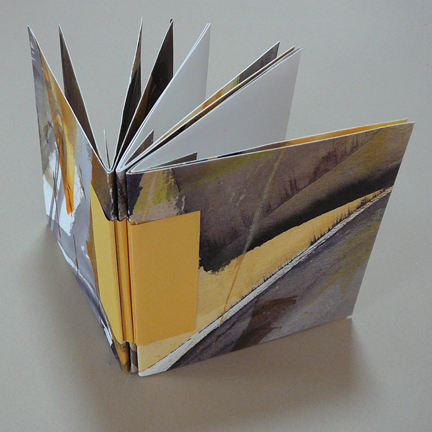 I achieved this by using a small craft punch to cut out ginkgo leaf shapes in the mountain folds which were highlighted by the contrasting paper strips inside, then used the cut out shapes to decorate the cover. I'm sure people will come up with lots of ingenious ways to use this super structure. Wishing you and your readers a happy holiday season! Rats! I am away and don't have all my tools - wondering if I have enough stuff to try this later - how clever! Thanks for sharing. 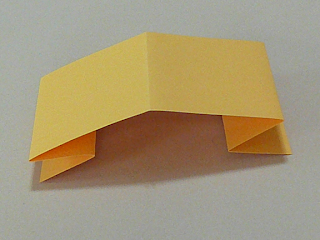 One piece of heavyweight paper or card (to cut into three strips), minimum size 3" x 5" [8 cm x 13 cm], grained long. 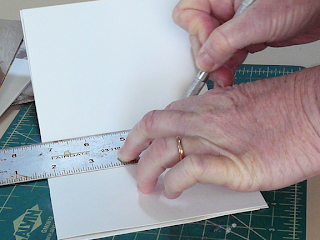 (Note: 5" x 5" [13 cm x 13 cm] will be easier to trim to 1" x 5" [2.54 cm x 13 cm] strips). Thanks for that! I've revised the materials list to reflect your corrections. I think I meant the minimum size could be 3" high because that is how high the "tubes" are. 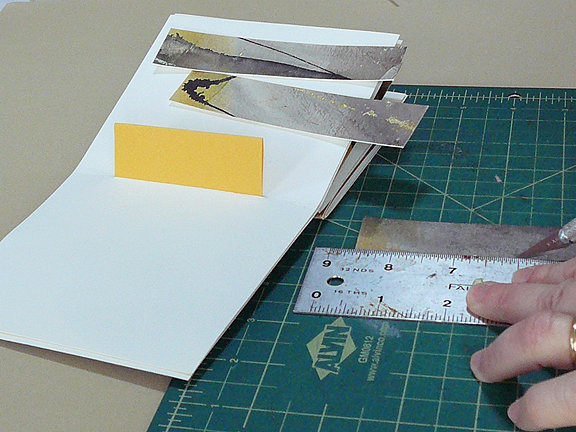 But 5" strips hold much better. It was confusing as it stood, so I've cleaned that up, too. Thanks for pointing it out!